WELCOME TO MIKHAEL'S HOTEL ! The elegant boutique hotel with its contemporary interiors and professional service, creates the ideal retreat for both corporate and leisure visitors. The VIP Lounge offers a sophisticated private living room feel in a comfortable and contemporary setting. Le Dome's elegant settings are ideal for gala dinners, cocktails, exhibitions and wedding receptions. Mikhael's luxury rooms are a calm haven with panoramic views of the capital's main landmarks. During their stay, guests have access to the outdoor swimming pool with adjacent sundeck and towel service. 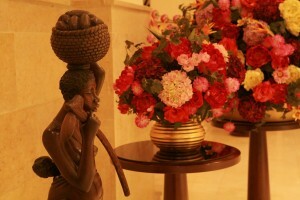 Located in the French-influenced downtown of Brazzaville, the capital and the largest city, the business hub of the Republic of Congo, the elegant Mikhael’s Hotel with its contemporary interiors, professional service and ideal locations, creates the ideal retreat for both corporate and leisure visitors. Mikhael’s boutique Hotel offers 92 spacious guest rooms and suites with private balconies overlooking the Hotel’s swimming pool or a charming mountain view. Whether hosting a product launch, a private seminar, or a business meeting, Mikhael’s Hotel professional team ensures your event will be a success. © 2011 Copyright by Mikhael's Hotel. All rights reserved.